The Rhinox 13 - 14 ton excavator digging buckets are built with durability in mind. Using high quality steels, and precision profiling and fabrication techniques, wear resistance has been optimised to increase the lifetime of the bucket. With years of experiance in the plant and excavation industry, we have take all the lessons we have learnt and implemented them into our design, to try and create the ultimate digging bucket! 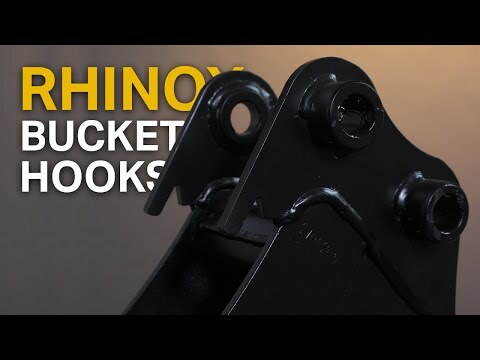 Including horizontal wear straps welded to the rear of the bucket shell, side cutters that are cast from a hardened steel, and bucket hooks on the front to aid in transportation and handling of the buckets. All our 13 and 14 ton digger buckets include pre-greased dummy pins bolted in place, ready for you to pick the bucket straight up and begin working with it! We keep large stocks of these buckets, so you can have your buckets delivered next day, instead of waiting weeks for your buckets to arrive!